#1 Your horse is grouchy, girthy, backed off his feed and performing poorly in the ring. It would be easy to write this horse off as a “grumpy Gus”—always cribbing, grinding his teeth when you girth him, turning his nose up at his feed, kicking out when you touch his belly – but maybe it’s not an attitude problem. Maybe he’s really not feeling well. An astounding 60% of performance horses suffer from gastric ulcers. This painful condition can cause a whole host of symptoms, from loss of appetite to poor performance and even recurrent colic. The only way to treat gastric ulcers is with prescription medication, like GastroGard. However, gastric support supplements may help maintain a healthy stomach before ulcers form or after a course of treatment. Look for antacids to safeguard the stomach, amino acids to support a healthy lining and/or herbs to provide soothing relief. #2 Your horse is always on edge, spooks at imaginary “monsters” and is completely unable (or unwilling) to focus on you. Whether you’re working with a “space cadet” or a ticking time bomb, an inattentive or spooky horse can make for a very frustrating ride. While we’ve all ridden horses that we would swear just enjoy being difficult, some so-called “personality problems” may be signs of a nutritional deficiency. Vitamin B1 and Magnesium are two key nutrients vital to the healthy function of the nervous system. Horses lacking Vitamin B1 can be anxious, spooky and unfocused, while clinical signs of Magnesium deficiency include nervousness and muscle tension. If your horse is being fed, exercised and trained properly, and he’s still too hot to handle, a calming supplement may be able to help. Look for one that includes Vitamin B1, Magnesium, and the amino acid L-Tryptophan. We’ve all known him—the poor horse that gains weight just looking at the grain bag. Different horses have different metabolisms, but if your horse is obese even on a restricted diet, his weight may be a symptom of a metabolic disorder, like Equine Metabolic Syndrome (EMS). 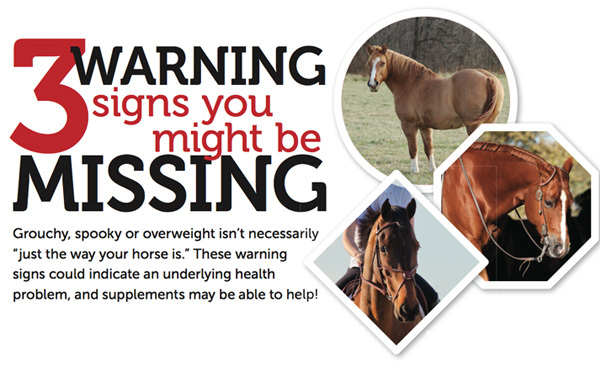 Horses with EMS don’t metabolize carbohydrates properly, resulting in problems like weight gain and laminitis. Additionally, horses with EMS suffer from insulin resistance (IR), a condition in which the body doesn’t respond properly to insulin, a critical hormone that transports sugar (glucose) from the bloodstream into cells. But supplements with ingredients such as Chromium, Magnesium and Vitamin E, along with certain herbs, can help support normal blood sugar levels, protect tissues and promote a healthy metabolism.